The goal of this project is to determine sediments sources that fed the equatorial Atlantic margin of South America during Meso-Cenozoic times in relationship with the vertical motions arising from rifting, Andean orogeny or mantle convection. This will be achieved by reconstructing paleogeographic maps for key periods highlighting areas of erosion and burial. Indicators such as thermochronology data, lateritic surfaces, paleocurrents and basins evolution will be used to further constrain sources and vertical motions. This work is a part of the larger "Guiana shield source-to-sink" project realized in collaboration with the BRGM (Bureau des Ressources Géologiques et Minières) and Total. The left picture is a view toward the SW of Mont Roraima belonging to the Amazonian craton. It is mainly made of siltstones and quartzarenites 1.88 Ga old whose alteration under tropical climate during Meso-Cenozoic produced a sharp plateau. Laterites are found on top of the terrace-like surfaces of the foreground/middleground of the photo. The aim of our project is to simulate the long-wavelength, flexural isostatic response of the African plate to sediment transfers due to Meso-Cenozoic erosion - deposition processes in order to extract the residual topography driven by mantle dynamics. Our work will be based on the reconstruction and subtraction of two continental-scale erosional-depositional surfaces of Eocene and Late Cretaceous ages and their offshore extensions. 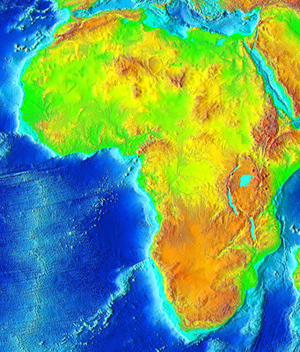 The first step of our project consists in computing crustal and lithospheric maps of the African plate considering its various crustal geological components (cratons, mobile belts, basins, rifts and passive margins of various ages and strengths). In order to consider these heterogeneities, we compute a 2D distribution of crustal densities and thermal parameters from geological data and use it as an input of our modeling. We combine elevation (picture on the right) and geoid anomaly data using a thermal analysis, following the method of Fullea et al. (2007) in order to map crustal and lithospheric thicknesses. In this approach, we assume local isostasy and consider a four-layer model made of crust and lithospheric mantle plus seawater and asthenosphere. In addition, we compare our results with crustal thickness datasets compiled from bibliography, existing global models such as CRUST 1.0, and tomographic lithospheric models. The obtained crustal thicknesses range from 30 to 45 km, with the thickest crust confined to the northern part of the West African Craton, the Kaapvaal craton, and the Congo cuvette. The crust in the East African Rift appears unrealistically thick (40-45 km) as it is not isotatically compensated, highlighting the dynamic effect of the African superswell. The thinnest crust (30-35 km) follows a central East-West trend coinciding with Cretaceous rifts and the Cameroon volcanic line. Pan-African mobile belts yield intermediate values of ca. 35-40 km. The lithosphere reaches 250 km beneath cratons, but remains globally thin (ca. 150-180 km) compared to tomographic models and considering the age of most geological provinces. As for the crust, the thinnest lithosphere is located in areas of Cretaceous-Jurassic rifting. Comparison with data from seismic experiments show that the output of our model is reasonable except for the Afar region where dynamic support of the mantle lead to overestimate crustal thicknesses. We are currently working on providing independent constraints to further validate and improve our model. Bajolet F., Robert A., Rouby D., Chardon D., Lithospheric and crustal structure of the African continent constrained by elevation, geoid and geology data, in preparation.